Betty Banks first encountered Russia as a very eager InTourist in 2003, and began studying Russian at the School of Slavonic and East European Studies at the University of London three years later. 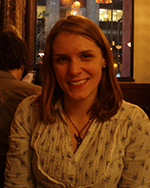 She received her BA in Russian and History and MA in Russian Studies from SSEES; studied in Moscow, Kazan and Petrozavodsk; spent a summer in Central Asia and a year or so in the “real world” before deciding to head across the Atlantic to continue her education. As a student in the history PhD program at NYU, Betty has a range of interests mostly clustered in cultural history and the post-war period of the Soviet Union, including the nature of Sovietness, race and ethnicity in the USSR, official culture and cultural politics, Soviet love stories, all of the Cold War and especially the relationship of the Soviet Union and the emerging Third World. People ask me all the time where I will, or want to live when I finish my PhD, as if I am supposed to be able to answer that question. Last Friday, a group of scholars gathered in the wonderful space of NYU’s newly established Africa house to discuss connections of various forms between Russian and Africa. We were a notably eclectic collective, including a Nigerian professor who studied in the USSR, the daughter of a Russian woman and an Angolan man who was born in Soviet Uzbekistan, an American historian of Russia married to an Africanist, a young scholar working on a book manuscript about the Soviet Afro-Asian writers’ organisation, a historian of African interested in global expression of blackness, a documentary film maker, and a early-stage graduate student perhaps feeling her way to a Russian-African topic. On Friday, March 29, the Jordan Center was pleased to welcome a number of speakers to participate in a lively discussion on movements of Greeks and Russians of various sorts around and across the Mediterranean. Colleagues from Greece and the US working on perhaps would be considered an unusual topic had the chance to share work and ideas with great success.